The Bayhawks are the most successful team in the 15-year history of Major League Lacrosse. They have won over 100 regular season games, 12 of their 16 postseason games, appeared in seven championship games, and earned a record five MLL championships. While doing so, they have given Chesapeake area fans the opportunity to see some of the world’s greatest stars, including Gary Gait, Tom Marechek, Mark Millon, Kyle Dixon, Mikey Powell, and John Grant Jr. Originally based in Baltimore, the 2001-2005 Bayhawks were the model of the MLL. They reached the postseason during all five seasons, appeared in the championship game in four of those years, and won the Steinfeld Cup in 2002 and 2005. 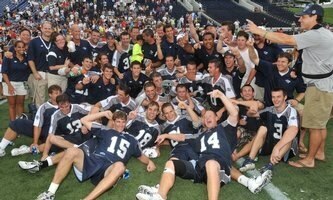 Many regard the 2005 Bayhawks as the greatest team ever assembled. Led by an all-Syracuse attack line of Gait, Marechek and Powell, the 2005 squad set league records for goals and assists. They faced their nemesis the Long Island Lizards in the championship game for the fourth time in five years and decisively defeated them 15-9. Gait, Powell and Marechek accounted for 22 goals over the two-game Championship Weekend. In 2006, the MLL expanded from six teams to ten. In addition to the expansion draft, retirements and injuries hurt the Bayhawks and they entered a fallow period of four years. During this time, the Baltimore Bayhawks became the Washington Bayhawks and by the end of the 2008 season the team had played in a total of five different locations. In 2009 the team signed a long-term arrangement with the Naval Academy to play in Annapolis, MD. In early 2010, the Bayhawks were purchased by Hometown Lacrosse, LLC, a group headed by Brendan Kelly, a former college player and club coach. Kelly promptly changed the team’s name to the Chesapeake Bayhawks to better reflect the organization’s regional appeal. That same year the team had a losing record and was in danger of missing the postseason for the fifth year in a row. Kelly appointed himself Head Coach, and hired former Loyola University and University of Maryland coach Dave Cottle as his Assistant Coach. Coach Kelly quickly revamped and re-energized the squad which resulted in victories for the last two games of the season. The result was a postseason appearance for the first time since 2005. The Bayhawks cruised by top seeded Boston in the semifinals before meeting the Lizards in the championship game for the fifth time in ten years. Chesapeake pulled away with five goals in the fourth quarter for a 13-8 win. Kelly brought the 2011 team back to the postseason, only to lose a heartbreaker to Boston in the semifinal game. Kelly then stepped down as Head Coach and promoted Dave Cottle to Head Coach for the next four years. The 2012 team had a strong group of midfielders led by Kyle Dixon, the MLL’s all-time two-point goal leader. Kelly and Cottle moved to beef up the attack and the result was a four-person unit of lacrosse legend John Grant, Jr., high-scoring Drew Westervelt, slick Ben Rubeor and quarterback Danny Glading. This quartet combined with midfielders Kyle Dixon, Steven Brooks, Michael Kimmel, Ben Hunt and Matt Abbott along with a stout defense, which included Michael Evans, helped the Bayhawks to improve a -31 goal differential in 2011 to +32 in 2012. 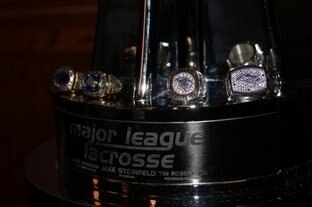 The upgraded Bayhawks won another Steinfeld Cup, defeating the Denver Outlaws. Virtually the same team returned in 2013 and the Bayhawks placed second in almost every MLL statistical category. However, the Outlaws ran off a perfect 14-0 regular season record, only to be stunned by the upstart Charlotte Hounds in the postseason semifinals. The Hounds’ magic wore off in the final as the Bayhawks won their fifth MLL Championship, 10-9. The 2014 and 2015 Bayhawks showcased a number of new and emerging stars including high-scoring veterans Matt Danowski, Brendan Mundof, and Joe Walters, as well as home-grown break-out midfielder Matt Abbott. Veteran Michael Evans and youthful Jesse Bernhardt have become annual all-stars on defense. After the 2015 season, Coach Cottle transitioned from his position as Head Coach to become the team’s General Manager. Assistant Coach Brian Reese was promoted to Head Coach for the 2016 season. Prior to joining the Bayhawks, Reese spent four years as the Denver Outlaws’ Head Coach. This significant MLL coaching experience was what Brendan Kelly was looking for in a new head coach. The Bayhawks acquired some new faces in the 2016 season. Myles Jones, the first overall pick in the 2016 Collegiate Draft, was acquired by a trade with the Atlanta Blaze for Matt Mackrides. The Bayhawks did not have a first or second round pick in the 2016 Collegiate draft, but with their first pick in the third round they selected John Maloney who made an immediate impact. With a few other additions, an average age of 25, and four picks in the first three rounds of the 2017 Collegiate draft the Bayhawks look well-positioned for the future.